You are one of 43 visitors. 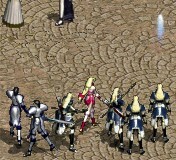 With a horde of elves, knights, mages and princes following his every step one might wonder what is so special about level 48 Constitution elf Zelt. It might be his craziness (which was enough to shock even me- Tae): the way he hunts nothing but gnolls and dwarves yet makes a million adena a day or the way he died 250 times at level 47. But the real reason is that he is the talk of the town, or the server in this case, with his brand new shiny Sayha�s Bow. 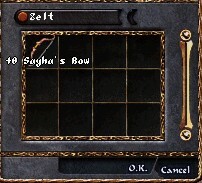 As you probably know today was the day that the Sayha�s Bow NPC Talass finally came out of hiding, but Zelt made sure to be way ahead of that. In fact, he had all the materials one needs to make the bow over a week ago! In total the materials cost him about 24 million adena, not bad considering that the currently unenchanted bow does an average of 23 damage on a elf with AC in the �50s. The reason the bow is still unenchanted is the fact that, after all that spending, poor Zelt was running out of money! 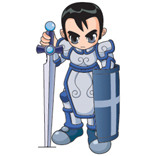 Zelt would like to thank Lawfui, SilverSlicer, Maxxima, his brother, SilverArcher, Azazael, Griever and ElvenBlaze. Woo, that was a mouthful! how-in-the-hell does he make 1 million a day and still be broke? QQ" wow, 23 dmg, and ure con? @_@ how come i only do 26-28 dmg with +7 sayha and i'm con too >_<! Yah!!! Atta boy Zelt congrats on the Sayah Bow. did he sell his elf blood to get 1mil a day??? Practically anyone can beat a bow elf. Congrats tho on the sayha. And are you going to tell us how he gets 1mil a day? Dont temp us like that ^^. Lvl 49 con knight/ken/Wesknight 4 ever! The only way they could probably make it any better is make it one handed(lol yeah right). or give a wind bonus def/attack. Or let the elf shoot (magical) wind arrows for -1 mp per shot(i wish). anyways, congrats..why would u sell it for? if u made a mil per day u can have just about anything u want. yay i sold my bow^_^ got 45mil, what to do? what to do? Yay lets blow some items!!!! i still say ancientcrossbow better dexelf with all that ac bonus + es with the + ancientxbow which i think u can afford making it +8 if u got luck or even +9 and be best bow. and u can get as drop or u can buy u waste more money on sayhabow where +9yumi is better. All Lies, except the Bow. 250 deaths, BS. 1 million Adena a day where he hunts? I've seen him, and even if he played 24 hours a day, he wouldn't make 1 million Adena a day there. If he makes 1 million Adena a day, why would he want/need to sell the bow? arent they gonna make sayha's bow 7/7 with a lot mroe damage and stuff QQ~! i can think of 27million other things to spend adena other then sayhas. dun know why u loser wasted ur time on it..and 1mil a day is like me being a girl elf lv 90 wit -40x ac -.- impossible unles u have no life...foolish child. anyway congratz on ur wasted life!!! !